Is it odd that every time I get a new power tool to perform a task, I get an urge to try and do it by hand as well? Anyway it seems to happen to me a lot. 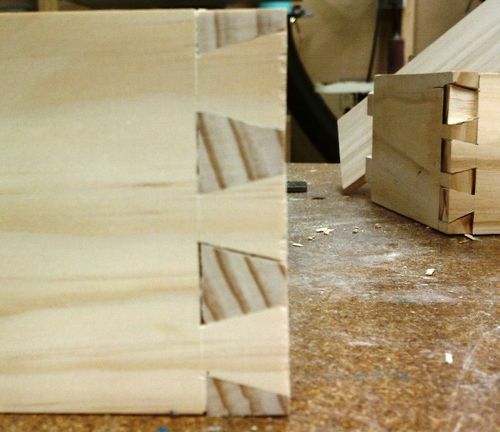 This year I received a dovetail jig for Christmas and was up and running cutting half-blind dovetails in no time. However, I have been wanting to learn techniques working with hand tools for a long time to expand my arsenal. Like any good woodworker in the internet age, I quickly ran to YouTube to find a good how-to video. The first one I happened on was a video by Village Carpenter I watch her methodically cut out a nice tight joint and thought…No Problem! I ran out to the shop and started hacking away at some 3/4” pine I had laying around. My first product…. 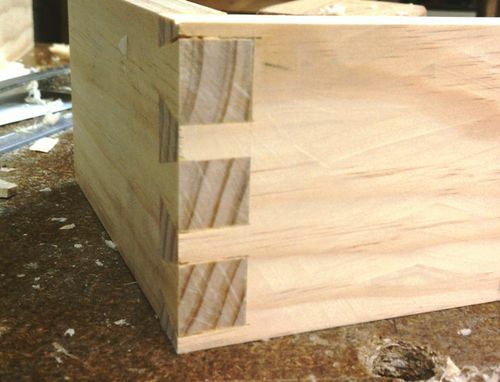 Ok, this is not really your classic dovetail….in fact not really a dove tail at all!! 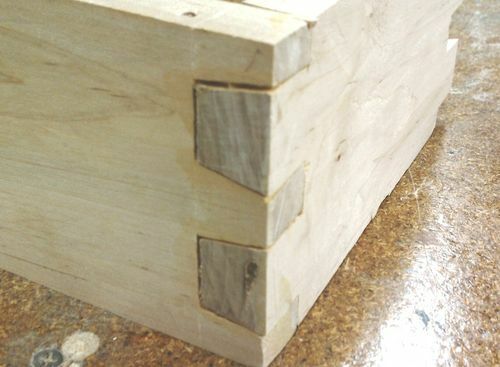 An angled box joint perhaps? I was in such a rush to just get cutting that I didn’t think through the layout or visualize what I was trying to create. So I glued it up anyway and just let it sit while I grabbed another set of boards, 3/8” in pine this time. I figured it would go a bit quicker…..
Low and behold….same problem. Ugh I’m a moron. again glue up and quit for the night! The next day I decided I would go back an do some more research and watch more videos. 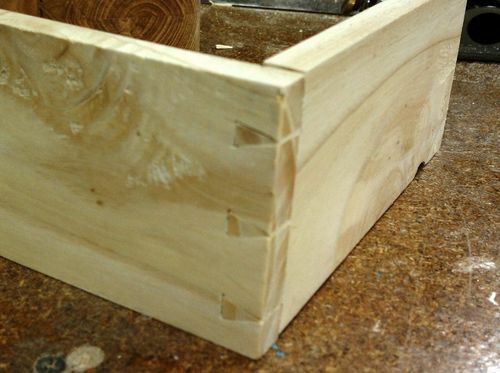 I also made the pledge to cut a dovetail a day until I got better. I remember reading about someone who did this a long time ago….I just looked it up and come to find the article was written by none other than Christopher Schwarz so how wrong could it be…Right? The next night I went back to the more conventional dovetail and got pretty good results. I tried to force the joint a bit and you can see the result. A nice split :(. You can also see that I got a little cocky and thought I could remember where the waste was supposed to be, but…. I wasn’t :( I will mark the waste from now on :). My next attempt so so. Everything seemed ok as I was cutting it but I was way off in terms of fit and alignment. It was down right sloppy. I had been cutting these with a cheap Craftsman gentleman’s saw that had been used to cut a variety of things other than wood. I decided I should try a better saw, I had heard that Japanese pull saws were pretty easy to learn how to use for dovetailing so I decided to get a Dozuki with a gift card I had received to the WoodSmith store in Des Moines. That night I also ran across a video by Robby Pederson on Woodworking Online. He operates a shop just north of me and only uses tools that were available in 1875. I think this is one of the best videos I’ve seen because he offers a lot of technique as well as tips and tricks. Up until this point I had been cutting “tails first”...Robby cut “pins first” so I thought I’d give that a try. The result…. Tonight I decided to revisit the “tails first” approach to see if there was any difference now that I had the Dozuki. I think this is the best one yet in terms of intial fit without havning to tweak too much. I glued this one up and planed down the excess to see what the finished product would look like. Aside from a little gap here and there I think it is pretty respectable for my 7th one. Now I have quite a few nights of practice ahead of me….I’ll post if I see dramatic improvement. Oh yeah, another great video resource I found tonight was from WoodTreks. This video also explains a lot of technique as they go. I should also mention that when I got the Dozuki, I abandoned using a coping saw to cut out waste because the blade I had is too thick to fit into the thin kerf. I have been using Robby Peterson’s method for waste removal. Great job and keep working at it! Thanks, Yeah it’d be nice to knock them out that fast….but I’ve got a ways to go. Thanks for sharing. It is encouraging to see you work and keep at it. Maybe I shall do the same. You are on the right track. PRACTICE! I watched everybody I could find. No two have the same method. The best advice I can give is get to know your tools. Find the method that is right for you. Go slow. Robby is a great teacher but he does it for a living. The best lesson I learned from him is body posture. 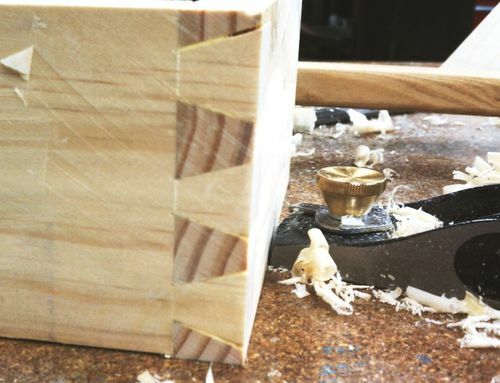 I still want to try the double bevel dovetail. But have not yet learned to lay it out correctly. When you have a problem change one thing and try again. Leave a little and chisel a little. I’m weird, I cut tails first and use a dozuki. you will be making half blind tails on drawers in no time. @Dave, yes he is very good. I took away importance of body posture, changing cutting angles to establish kerf and the ability to create a slightly concave shoulder to allow the edges to seat nicely. I’ve picked up tips from every video I’ve watched and it is interesting how many ways there are to accomplish the same thing. It has been an enjoyable process so far, and I hope to continue to get better. Alright, I just cut tonights dovetails and they didn’t seem to get any better….in fact they may be slightly more sloppy then last nights. Trying to be more and more careful with each one I decided I must be sawing sloppily (sp?). anyway I decided to run a test since I have always assumed I’ve been sawing straight. Much to my suprise, (or maybe not) I found out that I really only was cutting one cut consistently straight (right to left slope of tails ( / ). All of the other cuts were drifting to the right as you look down on the end grain. I tried a bunch of different things like adjusting body position, using thumb of opposite hand as a fence, adjusting my grip, pointing index finger vs not pointing index finger. Nothing seemed to work to consistently get rid of this bias. What did help was changing which side of the saw I was looking down. For all of my crooked cuts I was looking on the left side of the saw blade. When I switched to looking over the right side of the the blade, almost all of my test cuts were straight!!! I’m sure this is all written in a book somewhere or covered in basic woodworking but since I’m doing some things by trial and error I guess I’ll have to learn at the school of hard knocks. Tonight I proceeded to practice all of the cuts required for the dovetail over and over until I was comfortable that I could do them repeatably. 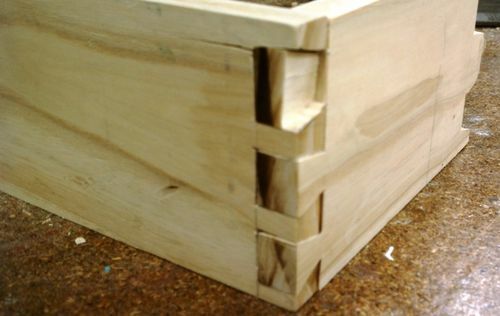 Tomorrow night I hope to have greater success on my dovetails. Try what John Reed Fox does. Set your tail board where the cut is perpendicular to the floor. Great progress. And thanks for the video link. I liked the video, and admire Robby’s skill. However, I would like to see if he uses the “pins first” technique on half-blinds. Tails first makes it a lot easier to transfer the measurements for a half blind, so I mostly do it that way all the time. Also noticed that his chisels were SHARP! He made quick work of that soft pine using light taps. My first ones in pine weren’t all that pretty, partly due to the chisel crushing back behind my line due to hitting it too hard. superdav721: I did some double bevels for a set of saw horses I made, to tie in the stringers to the splayed legs. I cut the miter on the end of the stringer first. Because I was using pine, I wanted about a 6:1 slope (about 9.5 degrees). I set my bevel gauge at 9.5 degrees and drew two lines, with the body of the gauge laying on the long edges of the board. Each line was where the long edge and the mitered end cut intersected. That gave me two reference lines to set the gauge with the body on the slope of the miter. The top line was the top angle on the tails, the bottom was the bottom angle. This gives the same relative angle to the direction of stress that a 90 degree dovetail would. Looked a little wonky but has held up well now for a couple years with a lot of abuse. @superdav721 I have tried that but I’m not sure it would have made a difference in this case with out making the sighting correction. when I was doing my initial testing I was just doing perpendicular cuts (straight rip) and couldn’t even get those to go. Once I changed my sighting, I seem to be able to make all the cuts without having to rearrange. The real test will be tomorrow since I have to run to hockey tonight. @Gofor Thanks, it is a new journey and one I hope to master. I’m not sure what he would do on half-blinds…probably the fastest way he can :). Yes his chisels are sharp and the pine works pretty fast. I did try on some ash and it split out pretty quick too. I don’t mind clearing the tails with this method, however the taper on the pins make it a little more difficult to clear the waste. I started with a marpels flush cut saw. It taught me a lot of things. I used it to even dovetail red oak. It still has all the teeth and isn’t bent. The dosuki is unforgiving with its tracking. Try starting it with a small bevel with your chisel. Push straight down on your keep side and cut the bevel on a 45 on the waste side. The parallel cut on the keep side will act as a fence and help the tracking start properly. If the saw tracts incorrectly, because of the 45 bevel you will error on the waste side. The you can pair it later with the chisel. I like to also start it, cut the face a little, cut the top and then the back. If all of that is right the saw wants to naturally remove the meat in the middle. It will follow the path of least resistance. Not imposing at all. I see so much talent in this site it is almost intimidating. From my perspective I want to post my work, seek honest feedback, and learn as much as I can. Your tips and tricks can only help me and others along the way, even if I don’t ultimately incorporate them. Very good progress John. Here is the link to a little blog I did some time back on fixing the small gaps that sometimes show up on our not always perfect work. This is an equally great technique for the newly initiated as for the more experienced. It can be a heart breaker to get most of them perfect with just one or two with small gaps! I just mention that it is always good to make your pins long enough that they will be slightly proud after assembly so you can use the technique in the blog and also so they don’t wind up to short. Another tip is that if the gaps between the dovetails are too small for a router shaft, then there will be no doubt that they are hand cut. 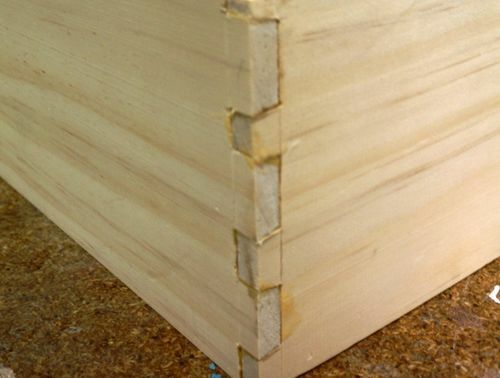 That’s why we hand cut dovetails isn’t it? @stefang Thanks for the link I can imagine that it will come in handy someday. 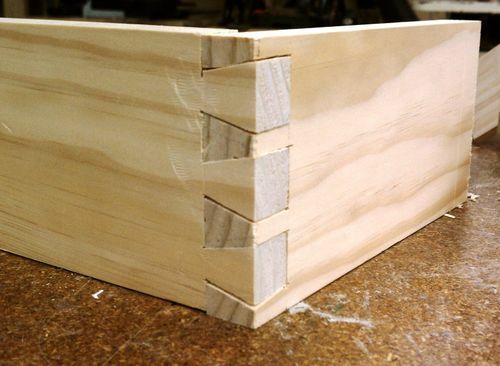 I’m really excited to try my hand at my set of dovetails tonight. I hope I’m not disappointed in the results….and if I am….try try again. 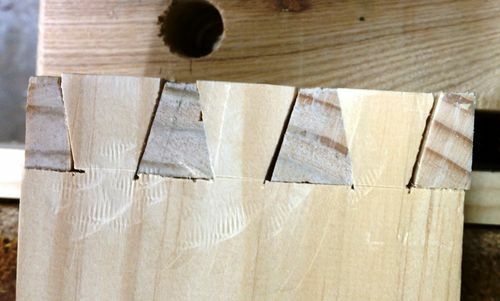 Frank Klaus had a video for hand cut dovetails. I’ve made a few boxes and cut by hand but it’s much easier to use the jig. Hoakie that is a really nice progression. Just keep reminding yourself that the best lessons learned are learned as a result of a mistake. Regarding the saw drifting on one cut more so than the other, it is likely your eye alignment but it is also possible your saw wanders a bit too as a result of more set on one side than the other. On you gent saw you can drag the side that it wanders toward, along a fine sharpening stone and it will decrease the set on that side. I can’t tell from your photos whether you are using a knife to lay out the tails and pins. I knife can have a big impact on your accuracy, just be sure to always face the knife bevel (or the part that leans) toward your waste side of the cut. It creates a little fence for your saw to start and track along. Thanks for sharing this progression, it was fun to read and educational too.